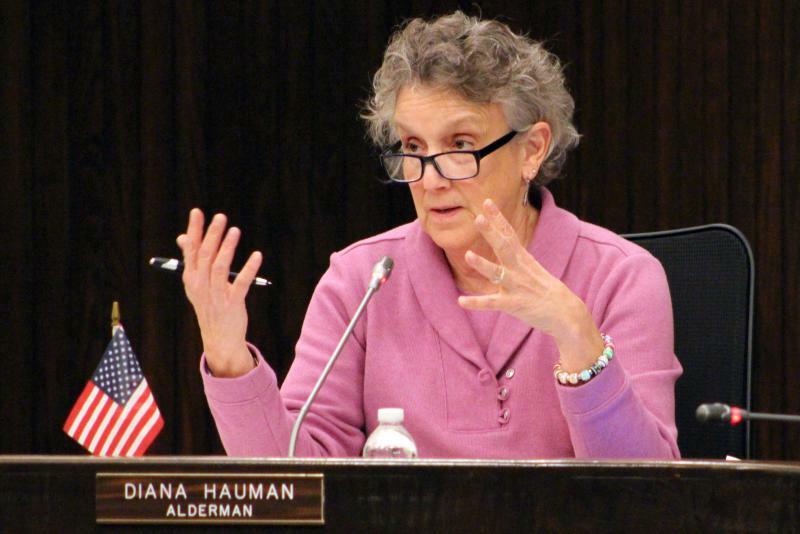 Alderman Karen Schmidt became emotional at Monday's council meeting. She said she was told Mayor Tari Renner said aldermen were "popping champange bottles" for removing the Welcoming City ordinance from the agenda. Renner denies the allegation. 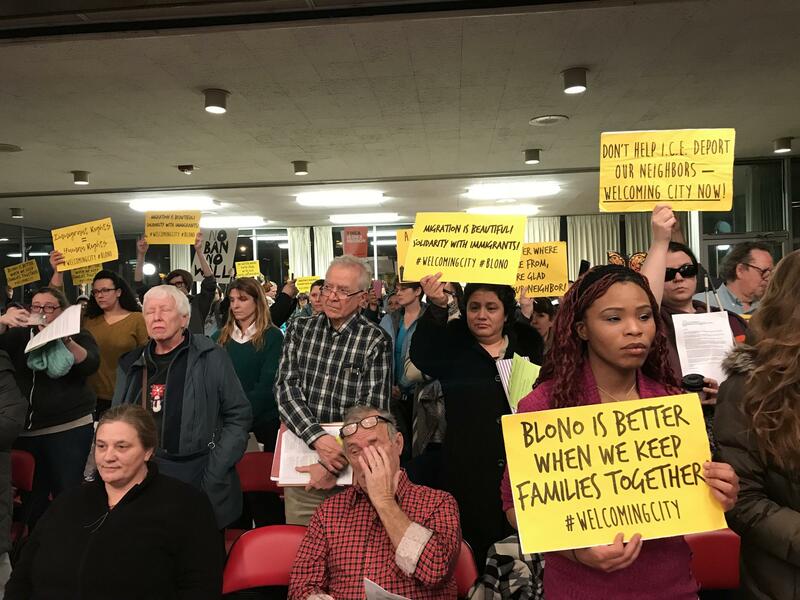 Supporters of the Welcoming City ordinance gather at Monday's Bloomington City Council meeting to urge council to reconsider discussion of the measure. 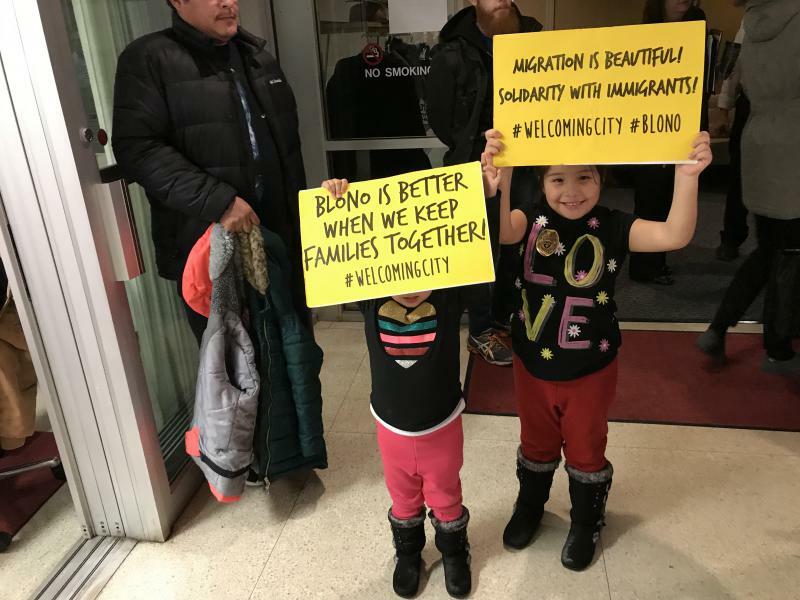 Two young girls hold signs in support of the Welcoming City ordinace at Monday's Bloomington City Council meeting. Five aldermen last week asked to remove discussion about a Welcoming City ordinance from the meeting agenda. Those aldermen were Kim Bray, Karen Schmidt, Joni Painter, David Sage and Mboka Mwilambwe. Schmidt spoke emotionally about what she said people told her Renner said about those five aldermen. “So, mayor, I have to say to you that it was with enormous dismay that I heard that you said to a social justice conference at ISU that the five of us were laughing about this and ‘popping champagne,’ because there is nothing further from the truth,” Schmidt said tearfully. Schmidt said she heard of the incident through several people. Renner said he doesn't remember saying it. Sage said the mayor needs to remember what he does and doesn’t say. 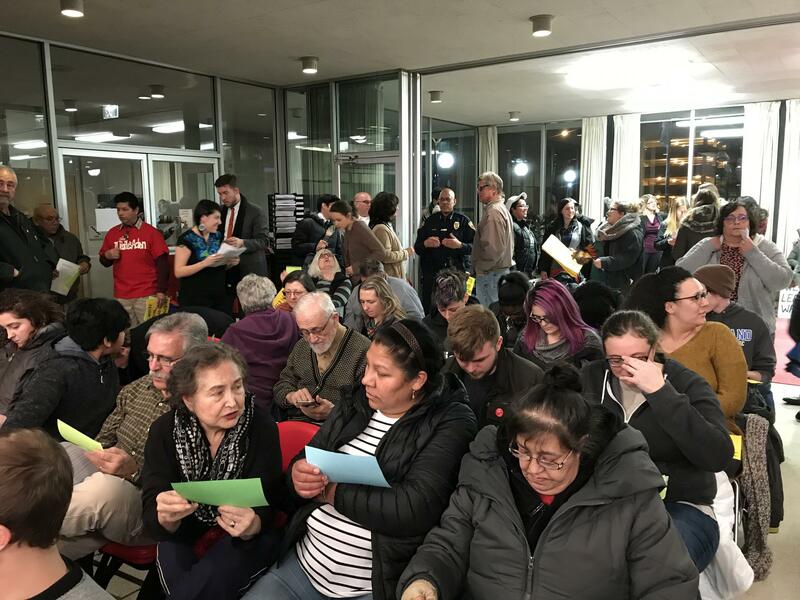 Schmidt said she wants the Town of Normal and other nongovernmental coalitions like Not In Our Town in the dialogue over a Welcoming City measure, which would limit the level of cooperation between Bloomington Police and federal immigration authorities. Schmidt said the five aldermen weren't saying no to the ordinance; they were saying they needed more time for discussion. Appearing Tuesday on GLT's Sound Ideas, Renner didn't deny that he made the comment but said it's difficult to respond to secondhand versions of his remarks. "Karen Schmidt is not upset because of something I said on a Friday afternoon that somebody says that I said and maybe twisted it and changed it by Monday," Renner said. "I think what she’s upset most about is the fact that before that, last week, she caught a lot of flak from some of her previous supporters on the Welcoming City ordinance that in the past she had said she was for, and now at least appeared to say we don’t even want a conversation." GLT's interview with Mayor Renner on the Welcoming City ordinance dispute. An Illinois State University spokesperson said Wednesday that Friday's conference session featuring Renner was not recorded. Meanwhile, there were sharp words at the end of the meeting between Renner and Painter over who decides what is on the agenda. They argued over who can and cannot control agenda items. Alderman Joni Painter and Mayor Tari Renner discuss agenda-setting. Painter said the mayor is dragging aldermen through the mud and makes them out to be a problem for him making progress. Renner on Tuesday downplayed his role in creating the tension at Monday's meeting. 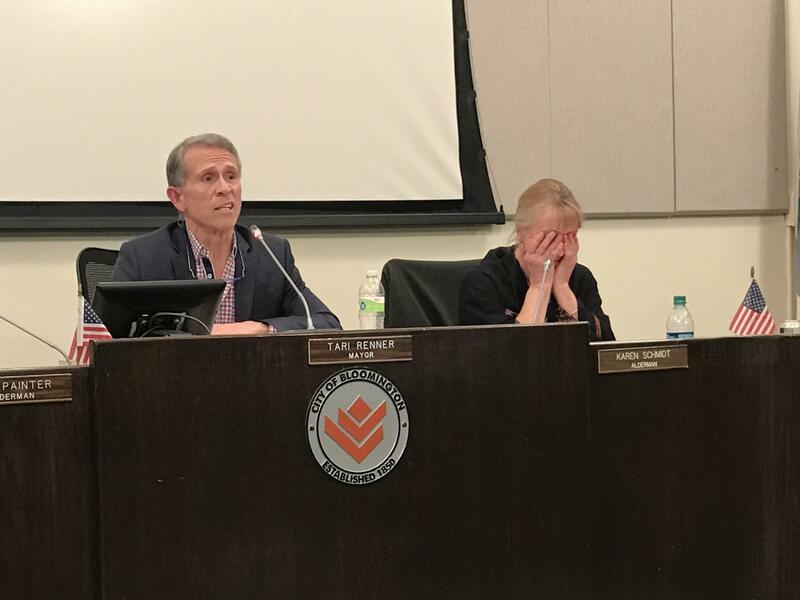 "Most of the tension last night was because of the blowback that the council got last week (on the Welcoming City ordinance)," Renner told GLT. "I was a convenient whipping boy because I'm also the one who's been most actively pursuing a Welcoming City ordinance." Renner said "obviously these are relationships that need to be repaired." He said he didn't like how aldermen approached city staff directly to get the Welcoming City ordinance removed from the agenda. Alderman Amelia Buragas said it’s ironic that the topic of a heated discussion was taken off the agenda in order to further discussion. "I think it's unfortunate that there's some division in council right now. I hope everyone remembers it comes from a place of a desire to be the most effective council possible, and that any one moment in time does not give us a complete picture in how council works together," Buragas said. 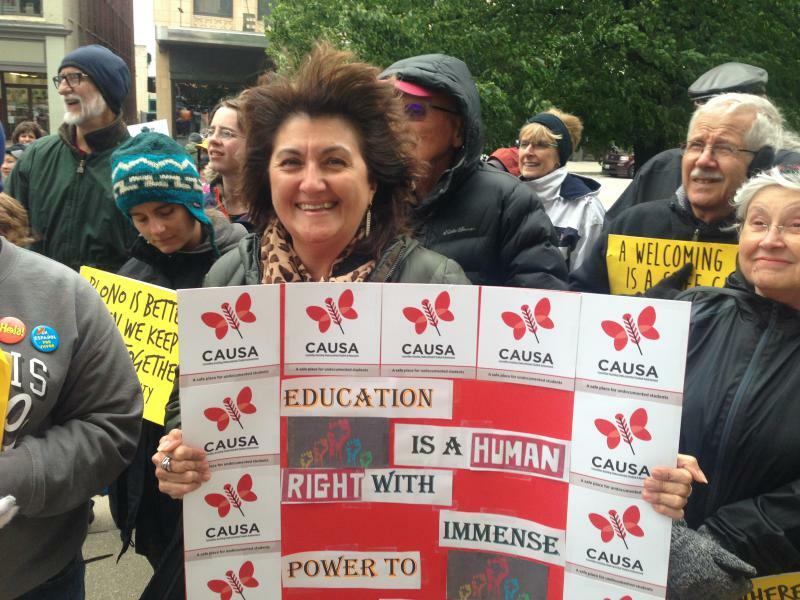 Dozens of people from the Keep Families Together Coalition turned out for Monday's meeting. One of the coalition's leaders, Don Carlson of the Illinois People's Action, addressed aldermen and raised concerns about newly disclosed emails showing a close working relationship between U.S. Immigration and Customs Enforcement (ICE) and Bloomington Police. 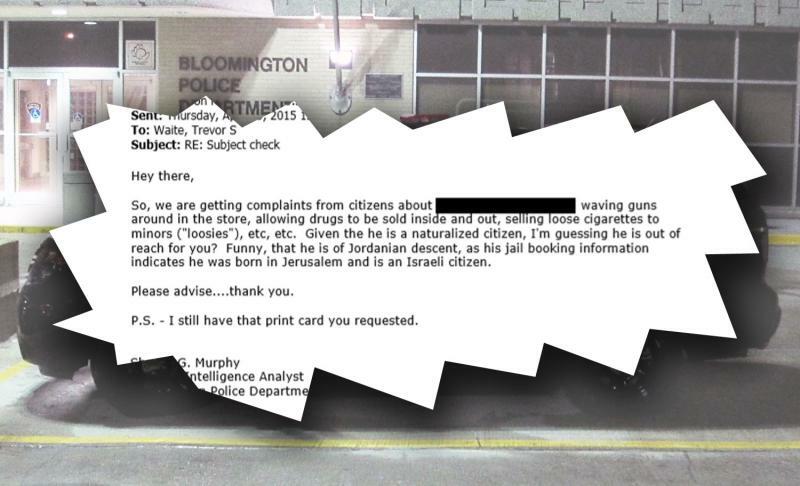 Police Chief Brendan Heffner downplayed any interactions between his officers and ICE officials at the Bloomington council meeting at the BCPA in December. Read the full statement from the Keep Families Together Coalition.